In the warmest winter regions of the United States, where frosts don't occur, royal palms (Roystonea regia) often grace parks and boulevards, making impressive vertical accents with feathery silhouettes. 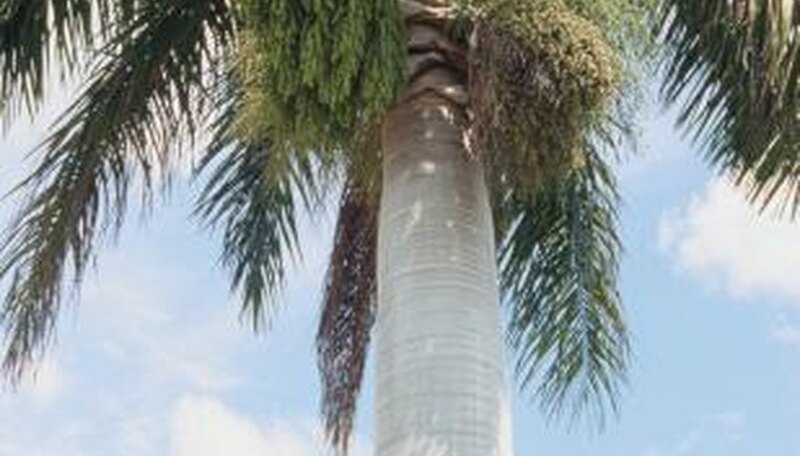 Growing with a smooth, concrete pylon-like trunk, a royal palm matures 50 to 100 feet tall. Horticulturists regard this palm as "self-cleaning," meaning it will drop old, dead fronds from the leafy canopy. This is dangerous since each 12- to 18-foot-long frond is heavy and can damage property or hurt people as it crashes to the ground with a loud thud. Trimming a royal palm involves the same process as with any other single-trunked palm but becomes increasingly more difficult the taller the palm grows. Put on a hard hat and leather gloves before cutting and removing any fronds or flowering stalks on a tall royal palm. Short-trunked individuals, no more than 10 feet tall, may have fronds pruned from a pruning saw mounted onto an extension pole. Do not prune palms while standing on a ladder. Hoist the hydraulic lift arm of a vehicle or install a scaffold adjacent to the royal palm's trunk. The person assigned to conduct the pruning will already be in the basket of the hydraulic lift, with his personal safety equipment and a pruning saw. Position the standing platform 4 to 5 feet below the area where all the fronds radiate out from the growing tip, known as the crownshaft. Cut into the base of the royal palm frond, as close to its attachment as to the crownshaft. A downward sawing motion with the pruning saw is easiest, but the angle of fronds in the lower quarter of the leafy canopy may not lend itself to be cut so easily. Grasp onto the frond with your free hand to help stabilize the frond as you saw. Guide and toss the royal palm frond as it begins to tear and drop off of the crownshaft as you saw. No one should be directly underneath you as you prune royal palm fronds, as mature plants produce leaves that may weigh between 40 to 80 lbs. each. Push the frond, if possible, to help propel it to fall outward from the trunk to the ground below. Remove all other fronds in the bottom quarter of the rounded canopy. If the frond is healthy and green, do not remove it because it is photosynthesizing light and making food for the plant. Do not remove any fronds that hang horizontally or angle upward from the crownshaft. Over-pruning weakens a royal palm, ridding it of food-making leaves and slowing its growth and vitality. Saw off any flowering or fruiting branch, either called an inflorescence or infructescese, respectively. This reproductive branch emerges from the base of the smooth green crownshaft, just above the top of the gray trunk. Saw the base of the inflorescence as close to the crownshaft's surface as possible without damaging the outer tissues of the crownshaft. Flowering branches occur anytime, from midwinter to midsummer, with the fruits later forming from early spring to early fall. Removing inflorescences/infructescences is optional, as they will dry and drop off on their own with time, just like old, withering fronds. Hire an arborist to trim tall royal palms. Choose services that are insured and bonded and use crews that have experience and proper equipment to access the high canopy readily and easily. There is no special time frame to prune royal palms; it may be done any time of year. In regions with tropical storms, though, trimming is usually completed outside of the hurricane season. Trim royal palms on windless days. There's less difficulty cutting and maneuvering the fronds then. Do not lean extension ladders onto the royal palm's trunk to trim the heavy fronds. The twisting and dropping cut fronds can easily cause you to lose your balance or make your ladder unstable. Rain may make grasping and cutting palm fronds more difficult. Allow the soil to drain and become more stable after rain before driving a hydraulic lift or erect a scaffolding next to the palm. Dry soil creates a stronger footing for heavy equipment.